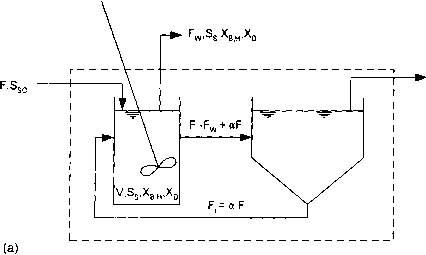 In developing the models in the preceding sections a portion of the flow from the bioreactor passed through a biomass separator, as shown in Figure 5.1. However, the characteristics of that separator were not specified. On a laboratory scale, reactors have been used which mimic closely the situation depicted in Figure 5.1. In one design, the biomass is contained in a vessel with porous walls through which clear liquid flows, leaving the biomass inside. The wastage flow is taken directly from the vessel. In another design, tangential-flow membrane filtration is used as a biomass separator, with a high recirculation How being removed from the bioreactor, passed over the filter, and returned to the bioreactor while a small percentage passes through the filter for discharge as the biomass-free effluent. Again, biomass wastage is through a stream removed directly from the bioreactor. Almost all full-scale bioreactor systems use sedimentation as the means of biomass separation, and as a consequence so do many lab-scale bioreactors. The technique that most closely mirrors the ideal situation pictured in Figure 5.1 is the internal, upflow clarifier. It employs a quiescent zone in the bioreactor which flow enters from the bottom. By designing the system so that the upflow velocity of the effluent fluid is less than the settling velocity of the biofloc, it is possible to discharge a clarified effluent while retaining the biomass in the reactor. Wastage is taken directly from the mixed bioreactor. The most common technique in practice is to use an external clarifier with return of a concentrated solids stream, called solids (or biomass) recycle, to the bioreactor. Two such systems are shown in Figure 5.2. The system shown in Figure 5.2a is called the Garretr configuration. Its distinguishing characteristic is that it wastes biomass directly from the bioreactor, just as was done in Figure 5.1. The system shown in Figure 5.2b is the configuration most often found in practice. Thus, it is called the conventional configuration. Its distinguishing characteristic is that biomass is wasted from the concentrated solids recycle stream. Figure 5.2 Schematic diagrams of two CSTRs with biomass recycle from sedimentation basins, (a) The Garrett configuration in which biomass is wasted directly from the reactor, (b) Conventional configuration in which biomass is wasted from the sludge recycle flow. The key features of the Garrett configuration are that for a CSTR of fixed volume, the SRT is controlled solely by the flow rate of the waste solids stream, F^, and the performance of the bioreactor is independent of the solids recycle flow rate, F,. This means that the recycle flow rate can be chosen to give proper operation of the settler, thereby ensuring that all biomass is returned to the bioreactor. In Chapter 10, we consider the question of the choice of that flow rate. The rationale behind the Garrett configuration can be seen by considering the system boundary to be the dashed line in Figure 5.2a. The flows in and out of that boundary are the same as those in Figure 5.1, and thus the Garrett configuration corresponds to the ideal bioreactor configuration used to derive the equations in Sections 5.1 and 5.2. Because the bioreactor is completely mixed, the concentration of the constituents in the effluent stream leaving it and flowing to the settler are the same as those in the bioreactor. Furthermore, if the settler is operated properly, the solids blanket will be small so that the mass of solids in the settler is small relative to the mass in the bioreactor. This has two effects. First, there will be little reaction in the settler so that the concentrations of soluble constituents in the recycle stream are the same as those in the bioreactor. Because all soluble concentrations are the same, the recycle of soluble constituents around the system has no impact on system performance. 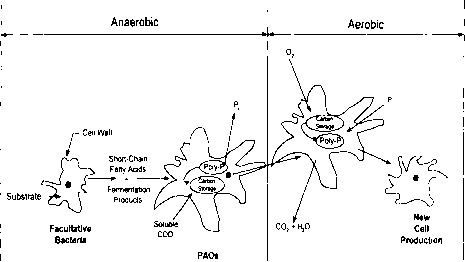 This can be shown by performing mass balances around both the bioreactor and the settler. Furthermore, since the settler is perfect, all biomass entering it is returned to the bioreactor, and thus the recycle stream has no impact on the biomass concentration in the bioreactor either. (In Chapter 10, we see how to correct system operation for the fact that the effluent stream from all real-world settlers contains a small amount of biomass.) Second, the SRT is still defined by Fq. 5.1. and since the concentration of biomass in the wastage stream is the same as the concentration in the bioreactor, Eq. 5.2 is also true. This means that the Garrett configuration conforms to the ideal situation considered in Sections 5.1 and 5 2, and the equations developed there are directly applicable. Because the recycle flow rate does not appear in any of those equations and because the SRT is not influenced by the recycle How rate, it can be seen that bioreactor performance is independent of it. 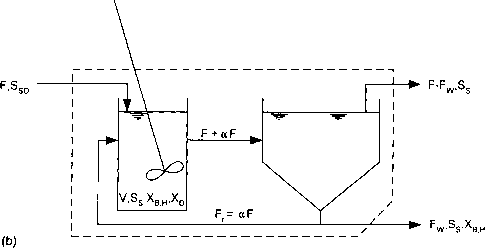 The conventional configuration shown in Figure 5.2b can also be defined bv a dashed system boundary and by use of the arguments above, the recycle flow rate need not appear in the system descriptive equations, provided they are written in terms of the system SRT. However, because the solids in the recycle flow (and hence in the wastage flow) are at a higher concentration than the solids in the bioreactor. Eq. 5.2 is no longer valid, although Eq. 5.1 is valid. Furthermore, the waste solids concentration in Eq. 5.1 is a function of the recycle flow rate. Thus, the key to understanding the impact of the recycle flow rate on the performance of a bioreactor with the conventional configuration is an understanding of the effect that the recycle flow rate has on the waste solids concentration. Examination of Figure 5.2b reveals that the concentration of any constituent in the wastage flow will be the same as the concentration in the solids recycle stream since the wastage flow comes from it. The MLSS in a bioreactor can generally be considered to be homogeneous and to settle without segregation so that the ratio of active biomass concentration to MLSS concentration in the recycle stream is the same as the ratio in the bioreactor. Thus, we may simply perform a mass balance on MLSS across the settler to determine the value of X/X^ for use in Eq. 5.1 for defining the SRT in terms of the recycle flow rate.